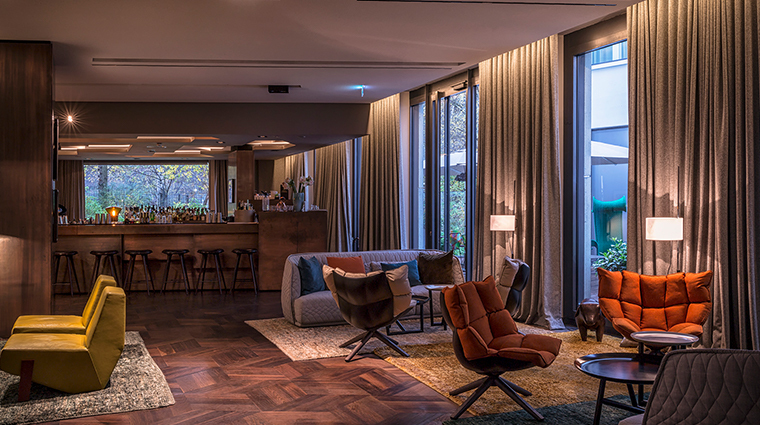 One of Berlin’s more recent upscale hotel openings, Das Stue is discreetly located in a peaceful corner of Berlin’s vast Tiergarten park. 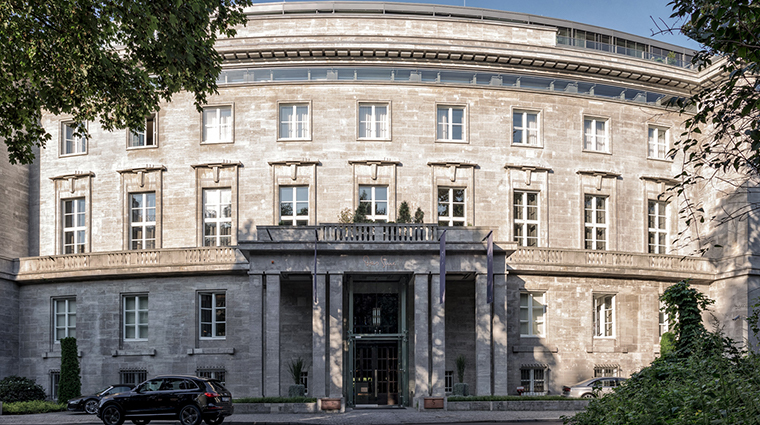 Occupying a historical and eye-catching building that once hosted the Danish embassy (das stue means “living room” in Danish), as well as a newer building behind the original, the hotel is located next to Zoo Berlin in the city’s diplomatic district. The building’s classic architectural grandeur is matched with a playful but sophisticated interior design. 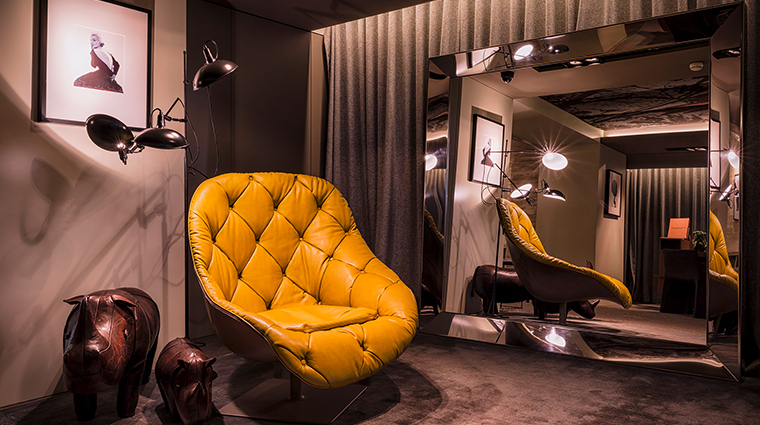 Luxe offerings include an acclaimed restaurant, a Susanne Kaufmann spa and an effortlessly cool cocktail bar. The luxury hotel’s curved, gray-brick exterior was constructed between 1938 and 1940 by German architect Johann Emil Schaudt, the man responsible for Berlin's KaDeWe department store. The interiors, designed by Patricia Urquiola, jump between black-and-white fine art and fashion photographs to playful sofas and animal sculptures. Restored original features include the dramatic travertine staircases in the lobby, which lead up to the first-floor rooms and clever nooks designed for relaxation. • The winding paths and historical memorials of the Tiergarten are steps away, as are the leafy banks of the Landwehr Canal. • The Zoologischer Garten area, which offers a limitless array of high end cafés, restaurants, shops and sights on and around streets like Kantstrasse and Kurfürstendamm, is a 15-minute stroll through the park. 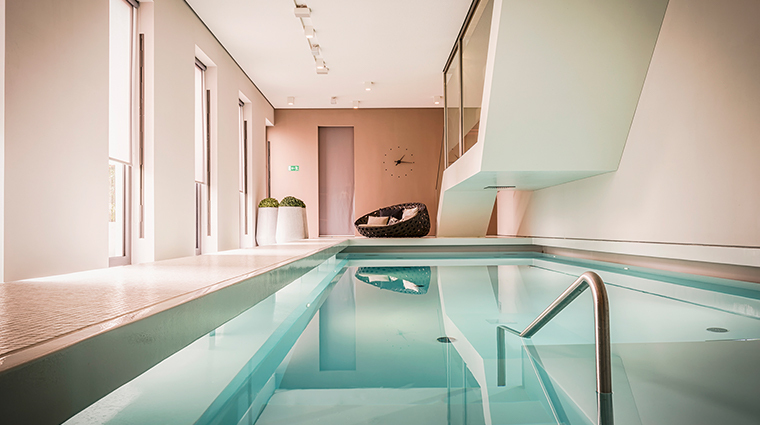 • The white-walled spa by Susanne Kaufmann is located on the ground floor and provides several treatment rooms, a handsome 46-foot indoor swimming pool and a Finnish sauna. 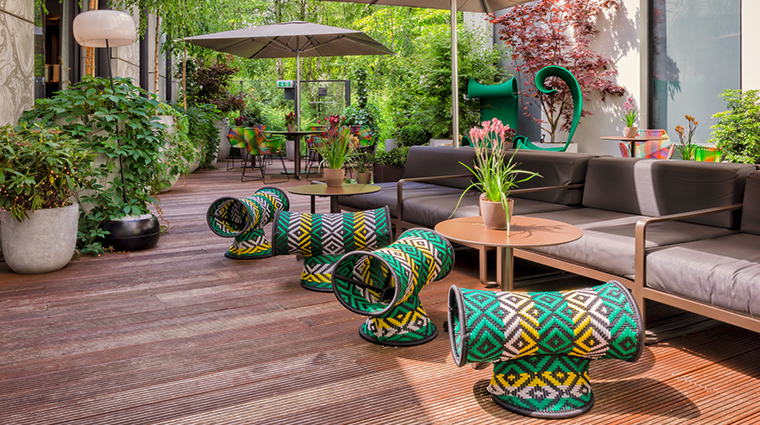 • As a guest of Das Stue, you’ll enjoy exclusive access to the Berlin Zoo through the bar’s terrace. You can even purchase tickets at the front desk. • The love and appreciation for art of the owners of Das Stue is constantly visible throughout the whole property. All public areas display a curated selection of their private collection, boasting an impressive range of early fashion photography and portraits. • While the proximity of the zoo and aquarium is useful for traveling families, adults and kids alike will enjoy the lakeside activities. • The property boasts black-and-white works from the likes of Horvat, Steichen or Newton, commissioned from magazines like Harper’s Bazaar or Vogue from the 50s and 60s as well as distinctly private shots of movie stars like Dorian Leigh, Marilyn Monroe and Marlene Dietrich, captured by Penn, Avedon or Bohrmann. 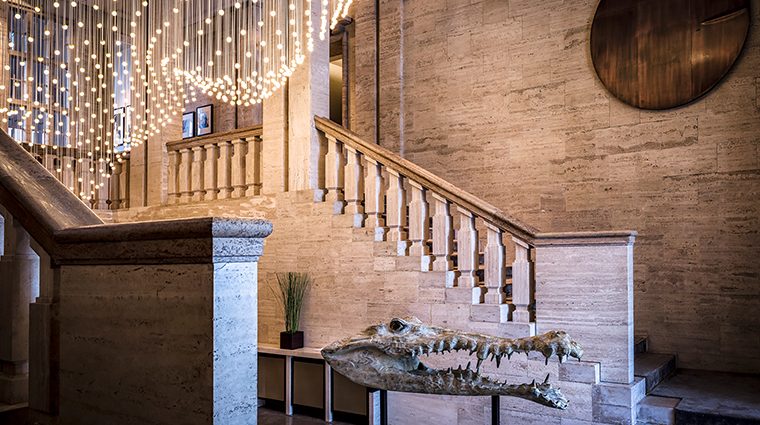 • Sculptures like the crocodile’s head of French artist Quentin Garel or Benedetta Mori’s meshwire animals act as a reminiscence to the adjacent zoo and were acquired exclusively for the hotel. • Rooms are split into three categories: Stue, Embassy and Suites. 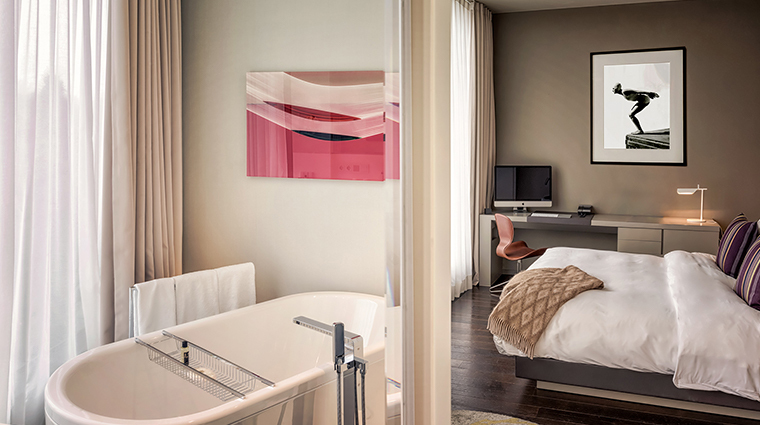 • All rooms are decorated in elegantly subdued color schemes (creams, browns, grays) and dotted with designer furniture like Arne Jacobsen’s Egg chairs, artsy photos on the walls and cleverly compact wardrobe and cupboard systems that favor sliding doors and push-to-open draws. 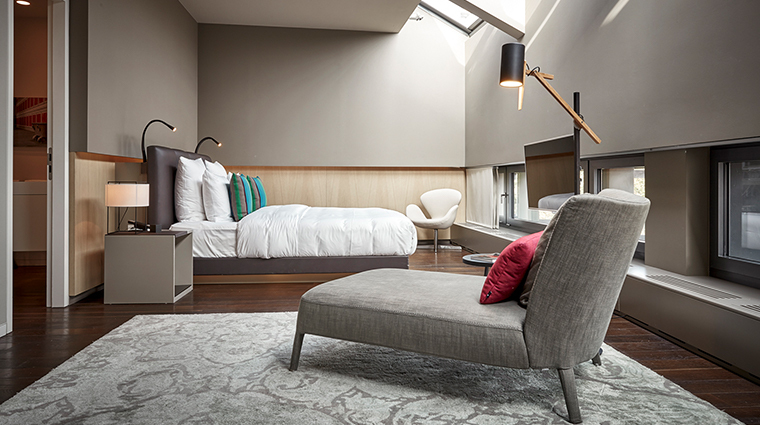 • The comfortable beds are draped in rich textiles, the sleek bathrooms have rain showers and Molton Brown products, and the abundant modern conveniences include Apple TV and Nespresso coffee machines. 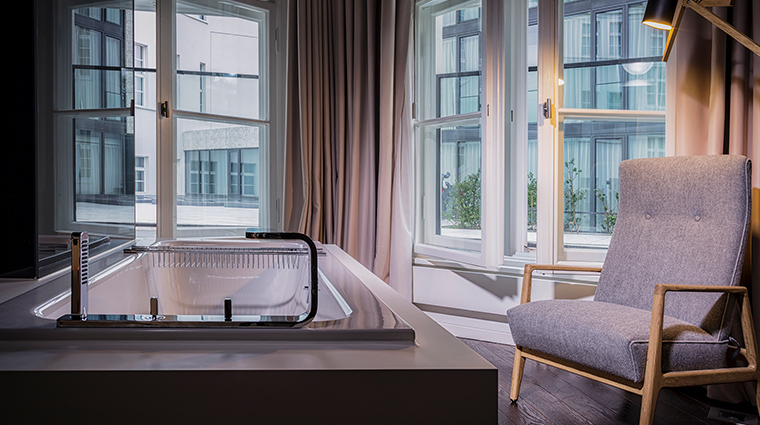 • For a balcony, terrace or freestanding bathtub, you’ll need to upgrade to an Embassy Room or a Suite, but you’ll also get more space and even better views across the Tiergarten or the zoo. • The Casual serves up a menu of Mediterranean-inspired mains that can be taken in the light-filled, wedge-shaped dining room (where breakfast is also served), in the funky bar lounge or, in nice weather, on the small terrace, which looks out to the ostrich enclosure at the zoo. 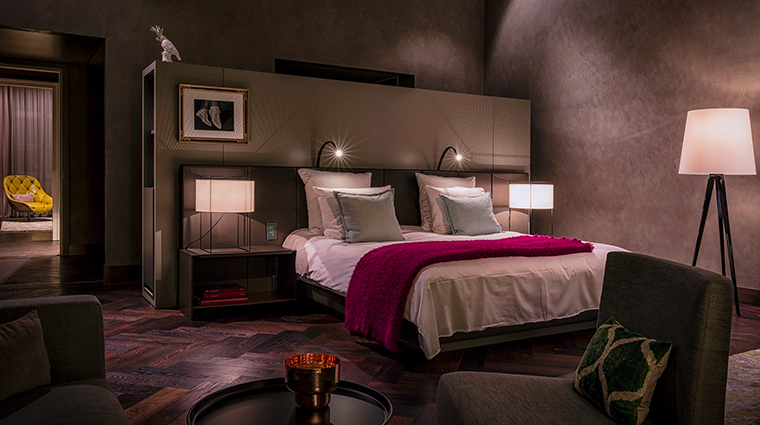 • The second dining option is reason enough to stay here — renowned chef Paco Pérez’s Cinco. • Here, cutting-edge 25-course tasting menus are are served in a swish but idiosyncratic dining room with a sculpture consisting of 86 hanging copper pots. • The colorful Berlin hotel bar, which is dotted with fashion-forward seating and interspersed with whimsical animal sculptures, offers an excellent range of vintage cocktails made from boutique spirits and a great wine list that includes many Spanish varieties.